The Nikon P7700 reference manual PDF is now online and ready to be downloaded. Simply right-click or tap on the links below to save it to your device or view in your browser. Nikon P7700 User’s Manual (English, printable) — 264 pages, 14.3 MB. Nikon P7700 User’s Manual (Spanish, printable) — 15.0 MB. You can print the entire PDF document or copy text from it without having to supply a password in order to do so. 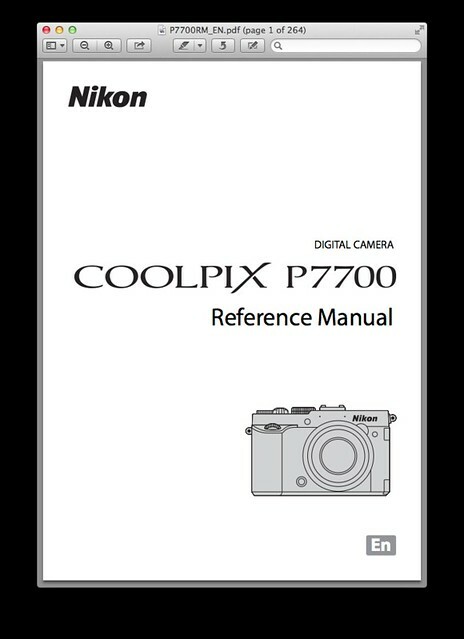 If the direct download links didn’t work for you, get the manuals from the official “User’s Manual — Coolpix P7700 — Reference Manual“” page. For macro shooters, the user guide specifies that the macro close-up focus range is from approximately 2 cm (0.8 in) (when zoomed to the wide-angle position), to ∞ (infinity). 40.5mm screw-on filter 40.5 NC. Lens hood HN-CP17 — required for attaching 58mm filters. Nikon Speedlight external flash units and SU-800 wireless speedlight commander. Nikon power connector EP-5A and AC adapter EH-5b. Remote control ML-L3 and remote cord MC-DC2.